For a limited time, Claim one of our FREE personalized stick decal. We pay for the decal, you cover s&h. Also, check out some of our awesome player gifts! Click here! Water resistant decals feature your name, number, team color and logo. 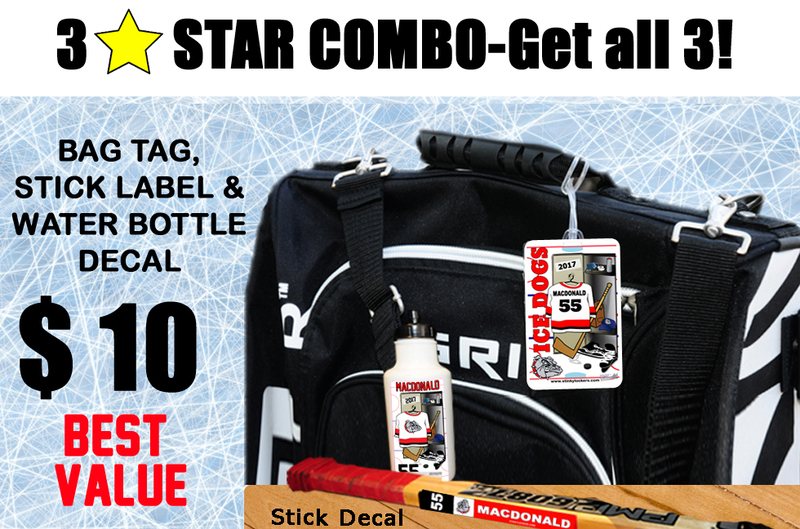 Ideal for hockey, lacrosse & ringette! Only $ 10 per player! Order for a player, the entire team or tournament! 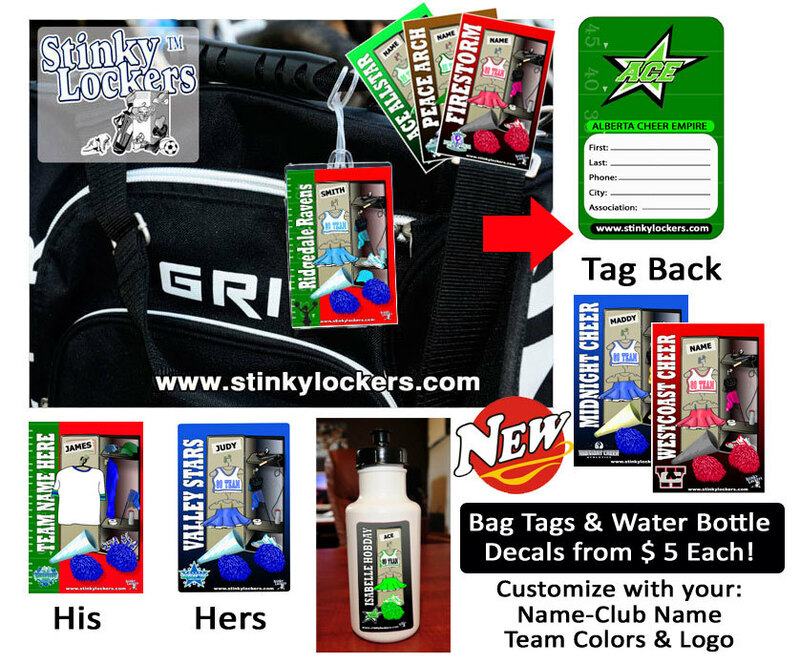 Some of the best ways to utilize personalized or customize bag tags from stinkylockers.com come from our customers. See some ideas below. We have tags for sports of all sorts. Click here to see our sport templates available. 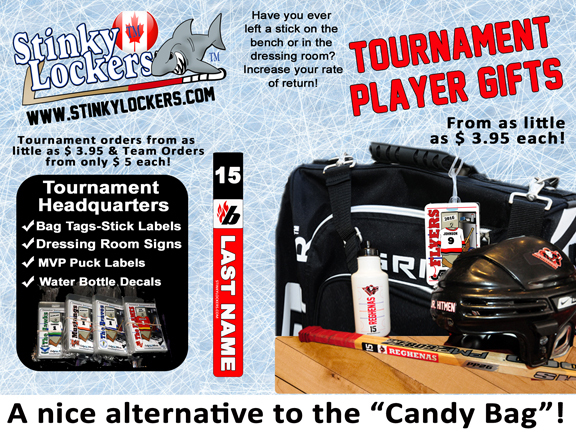 How many hockey tournaments have you attened the the kids received a goodie bag full of sugar and useless calories? Gatorade, G2 or a sport drink? Did you know the average tournament goodie bag cost the host tournament over $ 4.00? Pretty easy to do with a $ 2 sport drink. Contact us for a quote and get your very own custom bag tag or stick label from as little as *$ 3.95 each! Our personalized PVC bag tag is printed in full color on both sides. Personalize each tag with your player's name, number, team name, team colors and logo. Did you know that you can order a custom personalized bag tag for each and every player of a tournament for only $ 3.95 each. No order is too big or too small. We will make you a single tag for as little as $ 5! Visit our laundry room to see our jersey color combinations for bag tags. Also, be sure to check out the NEW Big League Stick Label and customize your own stick label for each player in your tournament. 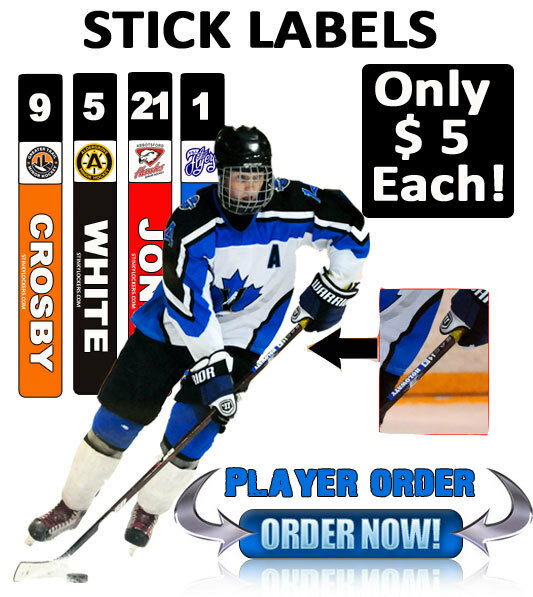 Personalized labels feature your name, number, logo & team color. Peel and stick to your own hockey, ringette or lacrosse stick. Tournament pricing starts at only $ 3.95 each. 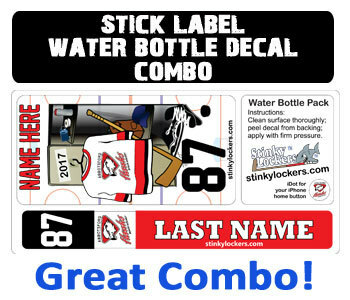 Some of our best sellers include the water bottle & stick label combo, our bag tag & stick labels. Looking for a unique team gift for your players at Christmas time? Many bag tags are available in sports of all sorts. Customize your tag with your player's name, number, team colors and even team logo. Upload your logo and we'll create a custom tag for each of your players. A team order of tags is only $ 5 each! Don't forget to check out the custom helmet decals for hockey, lacrosse, ringette, football and baseball! Looking for a great birthday goodie bag idea? How about a custom sport bag tag for each of your guests? Many kids have their birthday's around a theme or sport. 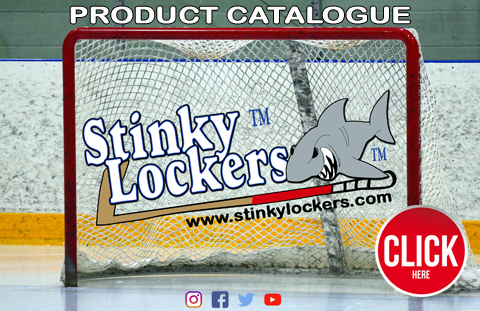 What better way than to personalize a gift for each of your guest with a sport tag by Stinky Lockers. Choose your sport among the list of sport tags. Did you know the number one Grad Gift purchase is luggage? Why not kick it up a knotch and customize your luggage with a personalized luggage tag? See our assortment of sport themed tags along with our custom luggage travel tags. Looking to organize a family reunion? Why not send everyone a custom bag tag for your reunion? It's a great way to start a reunion scrapbook after your event is over. Travelling by plane, train or automobile? Make identifying your bag easier with a custom personalized luggage tag. Have your kids ever brought home the wrong backpack? 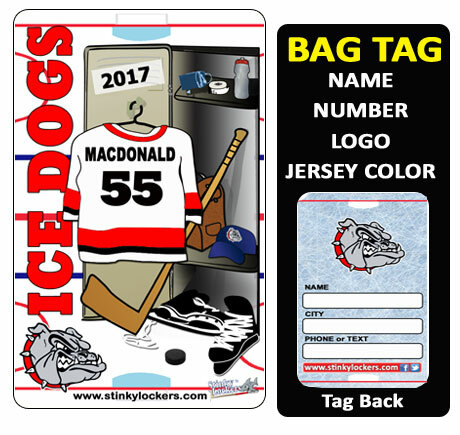 Help your kids, teachers and parents identify their bags with a custom themed personalized luggage tag. Ideal for backpack, laptop bag, sport bag and band case. Show your team colors team spirit and customize a tag with your name! Many sport themes including; hockey, baseball, fastpitch, lacrosse, ringette, dance, cheerleading, volleyball, soccer & more! Start your cheer season in style with a custom cheerleading luggage tag. Ideal for the travelling team. Both a male and female version are availalbe and optional features can include your team colors, team name, your name and team cheer logo. Just joined band class and received your instrument? Don't forget what mom said....put your name on it! Custom band tags by Stinky Locker. Personalize your own tag by choosing your instrument template and add your name. Instruments include, Clarinet, Flute, Guitar, Saxophone, Trombone, Trumpet, Tuba & Violin. Is your school to team travelling to Europe of somewhere for an out of country experience? Check out our personalized travels tags by Stinky Lockers. Custom player gifts from as little as $ 3.95 each!